So I bought this 1980 race car. 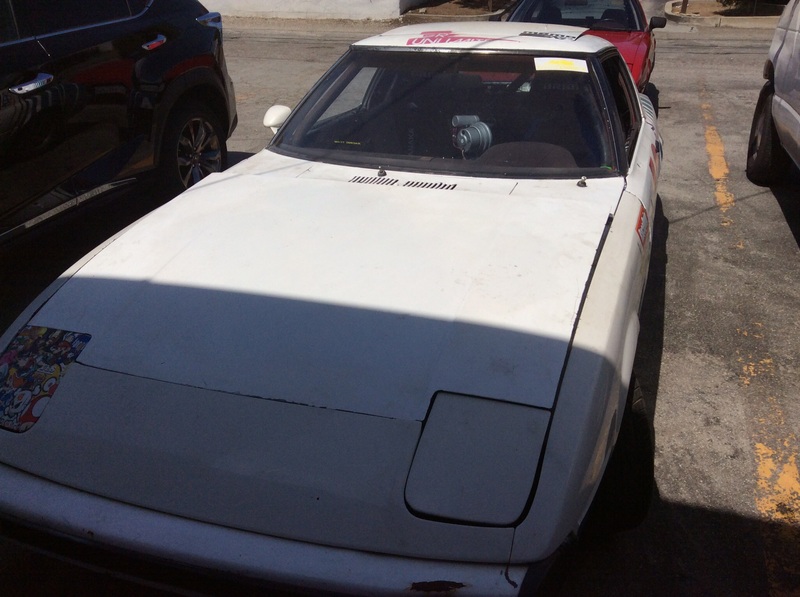 It has a unknown ported engine (at least bridge ported) full suspension, full exhaust, with a good clutch/flywheel, manual switch for the upgraded fuel pump, electric fan, roll cage, racing seats/belts, detach steering wheel. I still need to find a good brake kit for it, and get stainless steel braided lines. I also need a good carb, as I believe this still has the stock carb. Can I get some advice on what to get, and maybe if anyone has parts for sale, that would be great. I also think I need a good front air dam, that is aluminum for great down force. I plan to take it to the track with the ncrc, mostly to thunder hill to start off. well step one is just to figure out what you have. you will want to do a big inspection, you need to look at everything, brakes, bushings, tie rods, ball joints, cooling system, belts, replace anything that isn't in great shape. you need to look over the safety gear to make sure its installed right, and if its expired. you will want to make sure all the nuts and bolts on the chassis are tight. you should change all of the fluids, and filters. i wold set the alignment too, 1st gen needs nothing fancy, just try zero toe and maybe -2 or -2.5 camber. max out the caster. for ride height just make it even. step three would actually be to take it to an event, preferably something easy, like an auto-x or track day, and this will let you drive it, and you can get a feel for what its like, and where it needs work. Thanks, I am going to have P R Motorsports do the safety inspection. The racing seats are brand new so no worries on the expiration there. I think I'm going to order the holly carb kit for it, and I need to buy the upgraded racing brakes. I don't really know how to adjust the suspension but I'd imagine there are guys at my first track day that will help me with that. It would be great to connect with another rx7 guy going to the same track day at thunder hill as me. It's going to knock my socks off on the first track day I, sure of it. It'll probably be making around 200 hp give or take' and I've only got 185 Tokyo proxies on it right now. I'll probably be slip and sliding all over the place. Actually I decided on the weber intake and carb that they sell on racingbeat. It's over $1000, but totally worth it in the long run I think. Last edited by Pianoteacherevan; 07-22-15 at 06:58 PM. there are actually lots of rotary people in the bay area. we will be out at the NASA thunderhill in august i think. and yes, 200hp is FUN in a 1st gen.
Good point, I'll probably hold off till Christmas for my carb. The brakes is the immediate concern. I have to get my racing license too. this is a total aside, but i mentioned NASA, just because you can probably run TT and the license program at the same time. Cool, that's like a dirt track huh? Don't forget as you change things that if you want to race wheel to wheel your modifications have to be allowed by the group/class you are going to run in. in the SF Region, SCCA does race licensing school at the beginning of each year - usually Feb or March. With NASA you need to work your way up the ladder starting with HPDE and get signed off. Both organizations have a different feel so attend events of both and introduce yourself to people running other RX7s and get a feel for how it's run. NCRC aka NCRacing.org is another good organization. Cheaper and more laid back than the others so a good place to shake down the car and get comfortable with it. Good racing too but not as many cars in the race class. Skip the carb for now - it isn't legal for any IT class (ITA or ITE not sure about ITX) in SCCA where your car would be competitive. With NASA's points system in PT class, you may find that you don't want to run a different carb either to be competitive. Your biggest hurdle in racing the car in any organization is the condition of the safety equipment - cage, seat, seat mounts, harnesses, fire system or fire extinguisher and mounting, fuel port etc. To address that look at the stickers on the seats and harnesses to figure out the date of manufacturer and then look up the rules of each organization. They should be the same. The cage will need to be looked at by a tech inspector or an approved shop. TC Design in Santa Clara is one of the best roll cage builders in the SF Bay area and can help you there as needed. Quick Reply: I just bought a race car. What next?